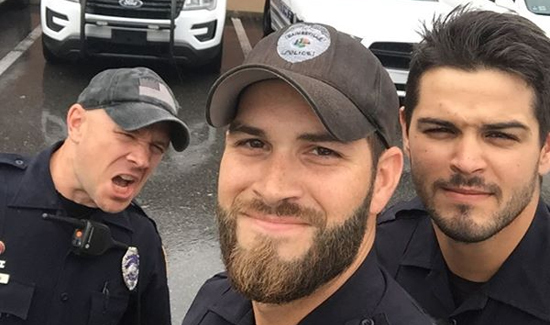 Yo, Gainesville: We have hunky cops too. The Gainesville Police Department inadvertently caused a stir with admirers earlier this week as some of the photographs the department posted on Facebook of officers dealing with the aftermath of Hurricane Irma caught more than a little attention. One photograph in particular. … Let’s just say heroes in uniform are hard to resist. The response was so intense that the GPD has quickly put in motion plans to produce a calendar of its comely officers to raise money for Hurricane Irma relief. Don’t think the sharp-eyed men in blue in Knoxville haven’t noticed. 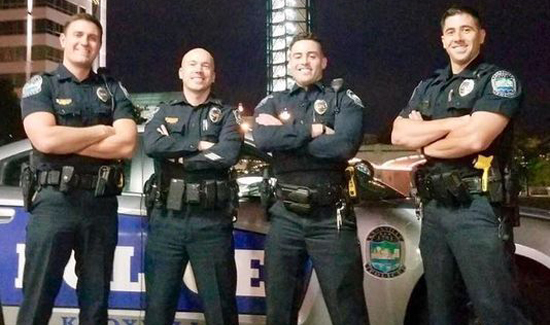 In the spirit of competition, spurred by Saturday’s Tennessee vs. Florida football game, on Wednesday night the Knoxville Police Department posted a photo on its Facebook page of four officers standing tall and proud against a backdrop of the tall-and-proud Sunsphere – along with a gorgeous K-9 officer in the foreground for good measure. Officers from the Gainesville, Fla., police department are attracting lots of attention for their fetching photos showing them responding to Irma. And with this post, the KPD challenged admirers to comment and make a small donation to any Hurricane Irma charity in the name of either the KPD or the GPD.